Read on for a summary of the findings. Over the past 10 years, researchers have been studying whether non-invasive brain stimulation can improve outcomes of aphasia treatment. It is thought that applying a small electrical current to the scalp can increase or decrease activity in cortical areas of the brain (see figure below). 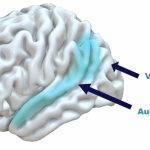 In aphasia, many studies have looked at anodal transcranial direct current stimulation (A-tDCS), which is the type of stimulation that increases cortical activity. 74 participants were enrolled in the study. 34 participants received A-tDC stimulation. 40 participants received a “sham” stimulation, or a placebo treatment. This was a double-blind study, meaning neither the participants or clinicians knew who was getting the tDCS, or who was getting the “sham” stimulation. All participants had a small electrode placed on the left side of their scalp (see the figure below). This made it difficult for both the participants and clinicians to know who was receiving the real stimulation or the sham. 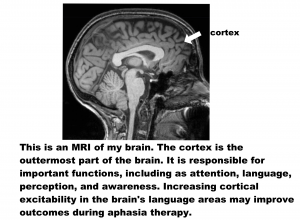 All participants received 45 minutes of computerized aphasia treatment, 5 times a week, for 3 weeks. During therapy, participants had 20 minutes of stimulation, or the sham (placebo) at the beginning of each treatment. 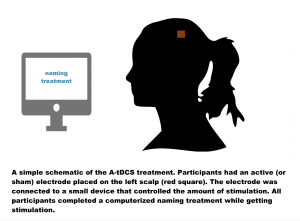 Results showed that the participants who received the actual A-tDCS stimulation improved on a naming test. On average, participants named ~14 more items than before treatment. Their improvements were maintained one month and six months after treatment. The participants who received the sham stimulation did show an increase in words named after therapy, but these participants did not increase as much as those who received A-tDCS. On average, they named ~8 more items after treatment. This was the first study to test A-tDCS in a large group of individuals with aphasia. The results of our study showed that brain stimulation may be a worthy adjunct to traditional behavioral treatment. We hope that continued research with A-tDCS in aphasia ultimately improves treatment options for the nearly two million individuals living with aphasia in the US.